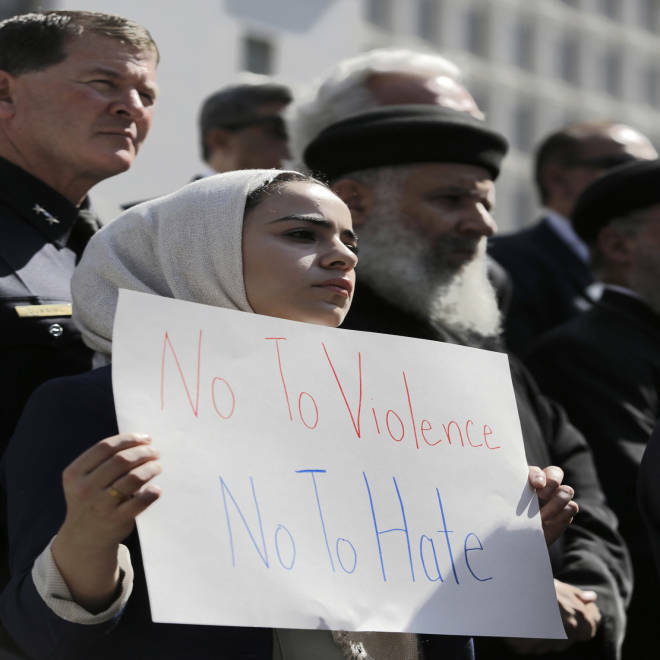 Soha Yassine attends an event held by Muslim and Coptic Christian leaders in Los Angeles on Monday condemning extremists they say are behind an anti-Islam film, and behind the violent reaction to it in the past week. American Muslims, sometimes accused of failing to speak out against violence carried out in the name of their religion, have forcefully condemned both the amateurish anti-Islam film that triggered recent riots and protest in the Middle East, Asia and north Africa and the violence that it engendered. "The American Muslim community has been very forceful and consistent in its rejection of a violent response to this intentionally provocative material," said Ibrahim Hooper, director of communications for the Council on American Islamic Relations, a nonprofit Muslim civil rights and advocacy group. The low-budget film "Innocence of Muslims," apparently made by an obscure producer in Los Angeles and circulated on YouTube, infuriated many Muslims with its cartoonish portrayal of the Prophet Muhammad. The imagery sparked Muslim protests and violence targeting U.S. diplomatic missions, including a deadly assault on the U.S. Consulate in Benghazi, Libya, that killed four Americans, including the U.S. ambassador to Libya. In a flurry of statements, press briefings, vigils, media interviews and interfaith events, groups representing American Muslims were quick to condemn the violence, host vigils for the victims and send condolences to the families of the Benghazi victims. But they also condemned the film, which seems deliberately designed to anger Muslims. In getting the initial response out, there was an opportunity to make two points, said Hooper. "People here understand that America and Americans shouldn’t be blamed for the actions of a few individuals who produced this hate film," said Hooper. "They should also understand that all Muslims shouldn’t be blamed for the acts of a few individuals that carried out these attacks as well." The Muslim and Arab American leaders also sought to speak to an overseas audience. Over the weekend, CAIR released an Arabic-language video appeal aimed at protesters, beseeching them not to blame ordinary Americans and the U.S. government for the film, which was "designed to provoke religious sensitivities and to distract from the positive efforts being undertaken to improve newly-free societies in the wake of the Arab Spring." Quoting from the Quran, the speaker, CAIR Executive Director Nihad Awad called on protesters "to emulate Islam's Prophet Muhammad, who did not retaliate in kind to personal abuse." On Tuesday, the organization released a similar video narrated by Imam Agdu Semih Tadese in Yoruba, a language spoken by millions in Nigeria and elsewhere in West Africa. "It is clear that the motive behind the film is to enrage Muslims and to display a hatred of Islam," according to subtitles on the video. "However, Muslims need to demonstrate good behavior as our Prophet (peace be upon him) dealt harmoniously with people. I hereby appeal to our scholars to calm down the youth and encourage people to cultivate exemplary behavior as Prophet Muhammad (peace be upon him) teaches." These messages and others also attempt to explain freedom of speech to non-Americans. "We play a significant role in translating for our fellow Arabs and Muslims in the region to let them know what the First Amendment rights are," said Abed Ayoub, legal director for the Arab-American Anti-Defamation Committee, a 32-year-old civil rights organization. Since the start of protests, Ayoub says ADC has spoken to dozens of Arab journalists in countries where freedom of speech is still an alien concept. The challenge, he said, is to dispel their belief that this film, or any other form of expression, has the U.S. government’s stamp of approval. "These individuals have been living under dictatorships for decades. Some of them just don’t get it," said Ayoub. On the steps of Los Angeles City Hall on Monday, Muslim leaders teamed up with elders from the Coptic Christian church to try to reclaim the stage from the presumptive filmmaker — an Egypt-born Coptic Christian named Nakoula Basseley Nakoula — and hotheaded Islamists inciting violence. The stakes are particularly high in Egypt, where the Copts say they have suffered a recent surge in discrimination and attacks by extremist Muslims. The Copts form a branch of Christians who are believed to have settled in Egypt shortly after the crucifixion of Jesus. Moderates in both religions say they want to return to the relative peace between Coptics and Muslim, populations that have coexisted for centuries. "We cannot allow the actions of a few deceived fanatical individuals to define our communities," said Bishop Serapion of the Coptic Orthodox Diocese of Los Angeles, who took aim at both the desecration of Islam by filmmakers and the violence of protesters. He was echoed by Maher Hathout, a co-founder of Muslim Public Affairs Council in Los Angeles, which hosted the event. "These people are neither Muslims nor Copts. Those are people ... with hearts full of hate and minds full of disease," Hathout told the crowd. "Our job together is to leave no room for these voices to manipulate and take over the arena. The voice that should be heard is our collective voices here." Everyday residents in the U.S. and elsewhere also are seeking to join the debate, using Twitter and other social media to distribute more cosmopolitan and diverse views to the global audience. Many seized on a Newsweek cover story this week titled "Muslim Rage," which accompanied by an unflattering image of screaming Muslim men. The article by Ayaan Hirsi Ali, a well-known critic of Islam, asserts that while some Muslims condemn the killings in the name of the faith, those voices tend to be marginalized. "The Muslim men and women (and yes, there are plenty of women) who support — whether actively or passively — the idea that blasphemers deserve to suffer punishment are not a fringe group," writes Hirsi Ali, a Somali-born woman who fled to Holland to escape an arranged marriage. "On the contrary, they represent the mainstream of contemporary Islam." 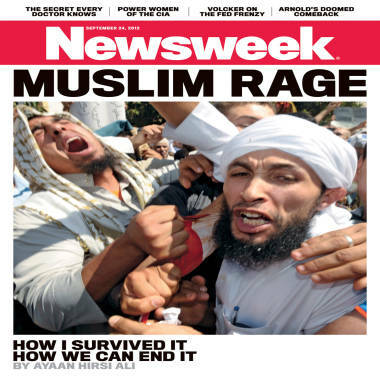 Newsweek called its Twitter followers to comment under the hashtag "#muslimrage." The subject went wildly viral, but perhaps not in the way that the magazine had in mind. Some of the tweets are insulting, some defensive, but many of the thousands of tweets seemed to ridicule Newsweek’s portrayal of Muslims and many — seemingly by Muslims — offered a lighter view of their "rage." "My iPhone compass won't point me toward Mecca. #muslimrage"
"Sudden midseason change of scarf trends; all oblong hijabs go out of fashion. #MuslimRage"
"Brothers are super strict/overprotective bc they don't want not one guy to see you.#MuslimRage"
"When you need to pray at the mall and all the stores with the good fitting rooms are full.#MuslimRage"
"Walks into a building with a backpack on, whole building get evacuated. #MuslimRage"
"Lost nephew at the airport but can't yell for him because his name is Jihad. #MuslimRage." The humorous response to #muslimrage was refreshing, according to Ayoub of ADC. "It’s good because it shows maturity," he said. "You know that we are moving past this (stereotype) — that this is not representative of who we are."